Review and assortment of the history of performed transactions on various parameters. 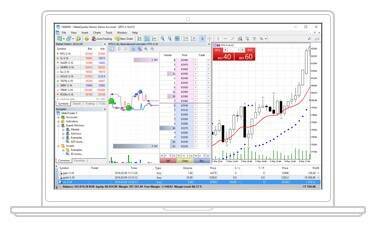 MetaTrader 5 (MT5) Platform is a popular trading platform allowing to perform trading operations and technical analysis on currency pairs of the Forex market, other financial instruments, as well as to trade on an exchange. Opportunity of trading in one of the two regimes: the regime of netting, exchange trading, when positions on one instrument are combined into one position with a weighted average price, as well as the opportunity of working with the “depth of market”; the regime of hedged (lock) trading, when all positions exist separately (as in MT4). Opportunity to set Buy Stop Limit and Sell Stop Limit activated orders. Full technical analysis – a large number of built-in trading indicators and linear tools, opportunity of writing own indicators and scripts, support of 21 time frames. Automated trading based on the built-in, object-oriented programming language MQL5, which allows clients to create their own trading programs (experts), scripts and indicators. With the help of a multicurrency strategy tester, a client can test his most complex individual strategies on historic data. Confidentiality of access and trading operations, as well as the availability of additional access only for monitoring trading operations. Local database of the history of quotations including import–export operations in the real time manner. Signals Service - a trader has the opportunity to become a provider of trading signals and a subscriber to trading signals. For more detailed information about the service, visit the website of the developer: www.mql5.com. To check the functionality, download MetaTrader 5 and start trading using our free demo. Find and open "Remove program"